Starring: Chris Hemsworth, Tom Hiddleston, Cate Blanchett, Jeff Goldblum, Tessa Thompson, Mark Ruffalo, and more. Talk about a film that could possibly be a 50/50 coin toss to be good or bad. The Thor series that has now become a trilogy with the release of “Thor: Ragnarock” has been an up and down ride for positive and negative reviews. The first Thor garnered positive praise from audiences while the second Thor, ‘Thor: The Dark World’, has received the credit of being “the worst film in the Marvel Cinematic Universe”. Now while that can be debated for yes or no all day, that is not why we are here in this specific review. We are here because we, well…you, just NEED to find out the Oberrating on “Thor: Ragnarok”. And by God you will find out! What an absolute excellent blend of hard-hitting action and hilarious comedy this film was. From the very start, the audience is exposed to the type of comedy that ‘Thor: Ragnarok’ was created to deliver and from that very start, it hits the ground sprinting. If I could make a call, this film was one of the more consistent and natural flowing films of the Marvel Cinematic Universe. Each scene felt necessary, every joke felt natural, every action bit was done flawlessly, and every character had a purpose; even down to the supporting characters who could have been viewed prematurely as simply an extra. ALMOST everything felt right in this film and I truly loved every second as I watched the film in laughter-induced, teary-eyed awe. Now, as I have already made my point that I enjoyed the comedy in this film thoroughly, I do now say that I understand the overwhelming response that may and have already been said about the film… “There was too much comedy,” a friend of mine critiques. Marvel has been infamous for being slammed by some audiences for their “happy-go-lucky” vibes within their films. I also have agreed to some extent that Marvel films have a tendency to have forced comedy at times. However, ‘Thor: Ragnarok’ was not one of those films. As I previously said, the comedy within this film felt natural. Understanding the director and understanding what the previous Thor films have done, one should not be surprised when seeing the comedy done within Ragnarok. Now whether the comedy is actually funny is a whole different beast and that is simply in the eyes of the beholder. But when it comes to this film and its comedy, I truly believe this is one of the funniest MCU films to date, on top of being one of the best films of the collection. These characters in ‘Thor: Ragnarok’ were some of the most memorable characters to date, in my opinion. Not to take anything away from our leads of Chris Hemsworth, Tom Hiddleston, and Cate Blanchett, whom of which were absolute titans in the film. The “supporting” characters in the film were home run performances. Without going into major details, between Idris Elba, Jeff Goldblum, Anthony Hopkins, the surprise cameos from certain large celebrities, and even Karl Urban, with what was expected, early on by myself, to be a very unnecessary and seemingly pathetic character. Beyond these key supporting characters, a major focus needs to be pointed at Tessa Thompson as Valkyrie. Tessa simply shines in every scene that she is involved in. A strong and impressive individual that easily steals the spotlight from the leads with almost every opportunity. I can only hope to see Valkyrie continue to make more appearances in the future beyond Infinity War. The Thor trilogy is complete. During our introduction to Thor, we watched a cocky heir to the Asgardian throne become a tad humble. Our second experience to Thor in ‘Thor: The Dark World’ (barely) provided an additional look into the character’s personality while mostly being a stepping stone film. Now, we have ‘Thor: Ragnarok’ which presents audiences with what I think is exactly what a lot have wanted. A deeper look into Asgardian history, a true purpose for Thor, and a showcase of Thor’s true power. As previously stated, for those not quite into the lore of the films or the characters in general, this film is sure to entertain. The action is top-notch. The comedy is pure gold. The characters were personable and memorable. 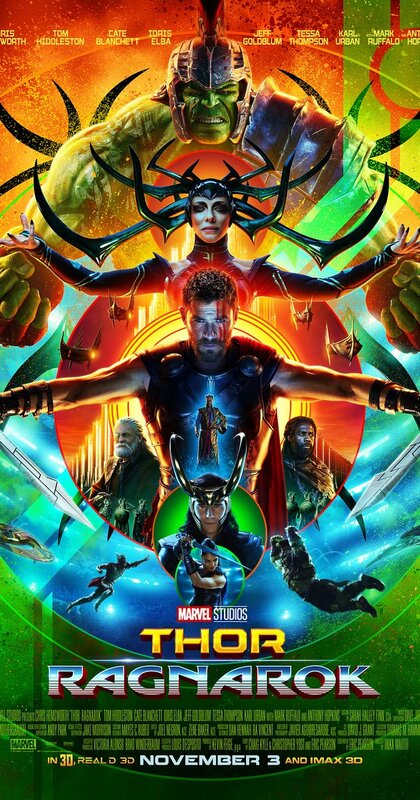 ‘Thor: Ragnarok’ is a film that should sit among the top of the Marvel Cinematic Universe’s rankings list and easily is one of the best films of the year. Posted in 2017 Movies, Marvel, Movie Review.Tagged 2017, Cate Blanchett, Chris Hemsworth, Christopher Yost, Craig Kyle, Eric Pearson, Jeff Goldblum, Karl Urban, Mark Ruffalo, Marvel, Marvel Cinematic Universe, Marvel Comics, Movie Blogger, Movie Reviews, Movies, Taika Waititi, Tessa Thompson, Thor, Thor Ragnarok, Tom Hiddleston.